This game happened a month ago at the end of November. My cunning opponent and I were joined by a new player, C, and an army we haven't played before - his Chaos Space Marines. We played a custom 7th Edition scenario for a 3 player game that we've done a few times since 5th and seems to be reasonably balanced. Scenario: 3 players, 3 objectives, played down the length of the 6x4 table with the 3 objectives on the centre line of the board. Players 2 and 3 each have 1000 points and deploy within 12" of the short table edges. Player 1 has 1500 points and deploys within 12" either side of the centre line. Player 2 and 3 roll off and deploy 1st and 2nd. Player 1 deploys last, and takes the 1st turn. Effectively what we are trying to do is ensure the player in the middle can't be alpha struck by being able to deploy after the other 2 players and taking the first move, as well as having enough points to absorb fire from both sides without having too many points to just table a single opponent in 2-3 turns before wiping out the other guy. Players 2 and 3 can roll to seize the initiative as per normal to keep everyone on their toes. We didn't bother with night fighting, mysterious objectives etc due to time available, but there is no reason that can't be included. This fight took place on a shrine world, the CSM deployment zone to the West, the SW deployment zone to the East, and the GSC&Tyranids deploying in the center zone. The 3 objectives are the statues on the centre line from North to South. The central third of the board was raised up about 2 inches, with 2 ramps from East and West to access the raised area from either end of the table (4 ramps total). The Space Wolves castle up with their tanks on their southern flank. 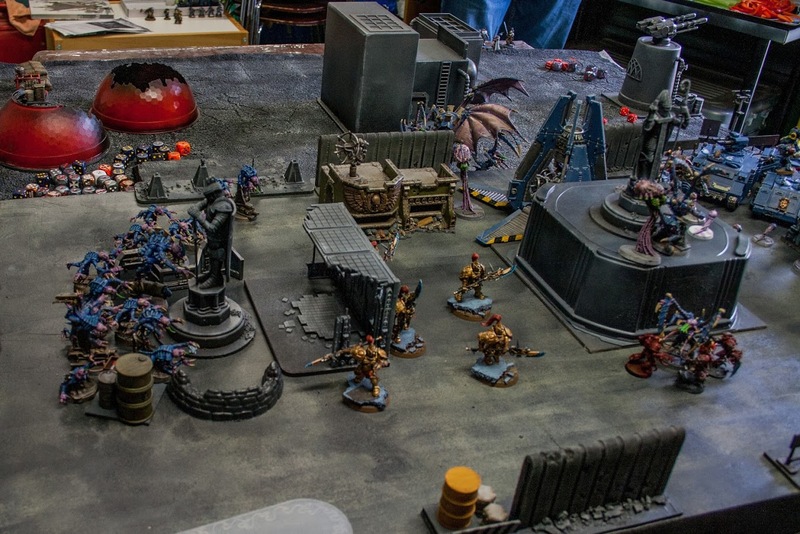 The CSM deploy as far forward as possible in their deployment zone - cultists massed on their southern (right) flank, chaos marines in the center and north (left), possessed in the north. The GSC reserve most units, deploying their bastion with a mucolid spore and a handful of Lictors. The Sisters embark onto the razorback and the wolves tanks move forward onto the southern ramp. The venerable dreadnought pods down next to the central objective and Brother Stumpy emerges to stare down Deathleaper. Nothing else happens. 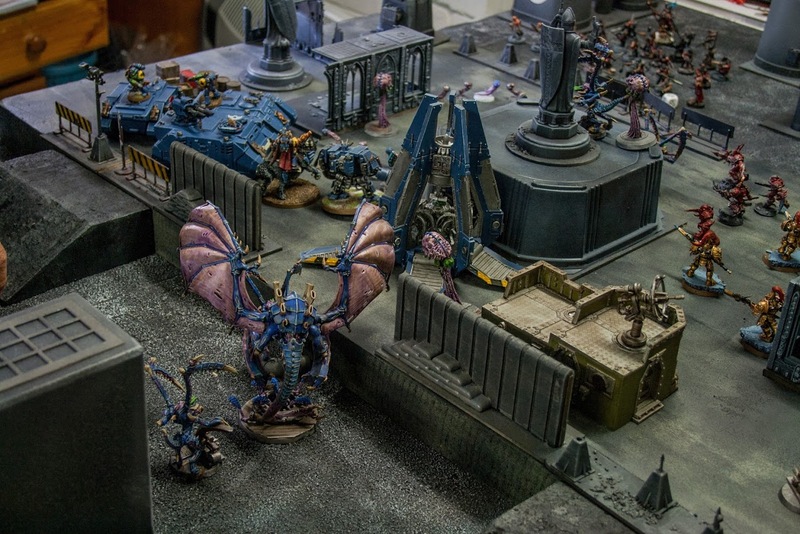 The GSC turn is quiet as the ambush awaits the arrival of the tyranid host. Deathleaper takes one look at Brother Stumpy and tactically withdraws. The spikey forces of chaos move forwards in a wave. The Possessed roll on the mutations table and gain Beasts and so charge forward up the northern access ramp for a turn 1 assault into a hapless lictor who takes some possessed with it but otherwise dies horribly. The Wolves continue the advance. The Custodes deepstrike into the northern flank, near the Possessed. Both the WGBL and Brother Stumpy advance to assault Deathleaper, Stumpy failing his charge roll, but the WGBL's thunderhammer is sufficient to the task at hand and Deathleaper is smashed into the ground. The Tyranid ambush is sprung! The First Curse arrives in the ruins around the northern objective. The Hive Tyranid zooms down and targets Brother Stumpy's rear armour, destroying him. Spore mines drop in around the central objective to be annoying to the wolves and to block the cultists from the central area. Two lictors move away from the possessed and the wolves to the central objective. The forces of chaos keep charging forwards. The Possessed charge another lictor inflicting a wound. In a fit of overconfidence, the Custodes charge into the First Curse and are brought down in a mass of high initiative rending wounds (what?! no invuln save?! argh). The Sisters emerge from their razorback and supported by the WGBL move East to assault 2 lictors around the base of the hive tyrant. One of the Rhinos containing grey hunters moves over to claim the southern objective. Chaos moves forwards again, the cultists emerging onto the central table zone, and a squad of chaos marines whipped forwards by their Dark Apostle. The two remaining Possessed try to assault the lictors around the central objective and die horribly to flesh hooks. The WGBL moves south to pursue a lictor that hit and ran away, while the rest of the wolves plink away at cultists and the bunker. The First Curse boils towards the northern squad of chaos marines and assaults them, shredding all but the squad leader and dark apostle. The cultists split, one unit moving to assault the centre, and the other moving towards the southern objective held by the wolves. In the north, the First Curse finish the chaos marines and consolidate back onto the northern objective. Mawlocs burrow in, wrecking the razorback. The WGBL assaults and kills a lictor. Sisters climb up to the central objective to assault another lictor but nothing much happens. Otherwise the grey hunters sit tight and plink out their hatches at the cultists. A mawloc strikes into the cultists, but otherwise the First Curse sits on the northern objective, and lictors contest the central objective. The cultists climb up and pull down the mawloc, like warrior ants killing a lizard (so so many dice, and I play orks! ), and consolidate into the southern objective to try and contest it, unfortunately the Grey Hunters have Objective Secured. ​And the game ends: Final scores are GSC 1 (northern objective), Space Wolves 1 (southern objective), Chaos Marines 0. Draw! ​Fun game, and fantastic to see a new army on the board. I was pretty happy when the game finished at the end of Turn 5, as my MSU squads of Grey Hunters were very unlikely to make much of a dent in the Cult of Slaughter. And the First Curse continue their reign as the scariest unit on the board. Last post for 2016, see you in 2017!